*Please note, childcare is available 7 days a week for club members. Hours will be added or altered depending on the demand. Daycare is available for children from 4 months to 11 years old. Each child must be pre-registered prior to booking child care, including the Universal Health Record form. Both forms may be emailed to childcare@mintdc.com. Please allow up to 48 hours for registrations to be approved. Pricing: $10 per child, per visit, with a maximum time limit of 90 minutes. Parental member photos must be on file in MBO prior to first childcare visit. Add to your individual membership for an additional $30/month. Included as part of our Family Membership. Walk-ins without an appointment are not permitted. All visits require advance reservation. Make your reservation online-only up to 72 hours in advance. Reservations may also be made up to an hour before desired time slot. Appointment cancellations within 6 hours and no-shows appointments are automatically charged $10. Please note that this charge applies to all reservations, including those on Unlimited. How do I reserve a visit? Easy online booking will be available to book your child. Is childcare available to non-members? Childcare is restricted to member use only. MINT staff does not change diapers. Parents will be notified when a diaper change is needed. For kids who are potty trained, we will alert the parent of the need when it arises. What do you need from me at drop off? A quick sign-in form is required, and you will also need to let us know where in the gym you plan to be during your visit so we may find you if needed. Who can pick up the child? For security reasons, only the same parent who dropped off the child may also pick up or sign out the child. Can my child be with me in class or on the fitness floor? 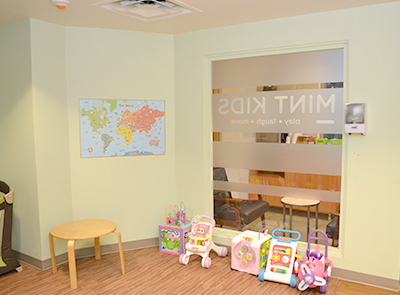 The playroom is built for kids fun and safety and the fitness areas are for adults. Children under 16 years of age are not permitted on the fitness floor or studio rooms. Do I have to be on-site while my child is in the childcare room? Yes, parents must remain in the facility for the entire duration of their child’s stay. How long can my child stay in the playroom? Since it’s only intended to be about the length of an average workout, the maximum is 90 minutes per member. Can my child stay late? 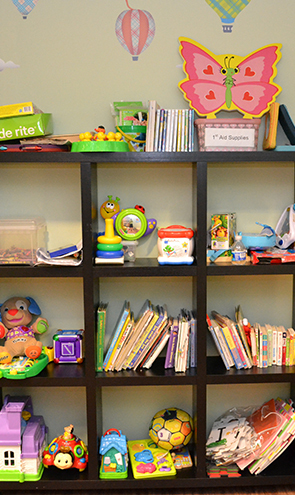 We staff the playroom for set hours, so all children must be picked up by the time the playroom room closes. Can I drop off my child during non-scheduled hours? For safety reasons, children may only be in the playroom during hours which are attended by our qualified staff. Does the playroom ever fill up? Yes. Use of the playroom is subject to availability. For safety reasons, our staff may stop admitting children if the ratio of children to staff becomes too high. What if my child’s a little under the weather? Please, please keep ill kids home. Our staff has strict instructions not to admit any child who appears to be sick. Also, if they’re home from school due to illness, please keep them home. Can I bring someone else’s child? In the interest of your child’s safety, you may bring only your own children into the playroom. Should I leave the car seat in the car? If your child is under nine months of age, please drop him or her off in a car seat or stroller. Anything that’s potentially dangerous, including sharp or pointy objects, items small enough to choke on, glass items, plastic bags, and markers not provided by our staff. Any club or specific babysitting staff may change or expand this list at their discretion or require that anything they consider inappropriate or dangerous be removed. Food and beverages are not permitted, except for beverages that are labeled and brought in non-spill containers. No, gratuities are not accepted. What if my kid is having a bad day? We appreciate that kids can be both terrible and magical. Positive behavior is encouraged, but if your kid earns a time-out, we’ll let you know. Our staff reserves the right to not admit or to remove any child behaving poorly. If a crying child cannot be consoled after a reasonable period, we will alert the parent, and at the staff’s discretion, possibly be asked to remove your child from the playroom.